In InterVarsity lingo, NSO stands for “New Student Outreach,” the first few weeks of the school year in which InterVarsity staff and student leaders meet incoming freshmen and other new friends and invite them to become part of our communities on campuses all over the country. These posts are a few snapshots of the beginning of the school year on a few of the campuses where I either staff or oversee other IV staff. This story happened on Thursday. Yesterday I went scouting at Flo Valley with my supervisor, Will. I’ve been wrestling a lot with questioning my own authority/giftings in the midst of planting a new ministry for the first time and I was feeling a lot of fear/confusion as we were walking on campus. We took some time to pray at the very beginning and felt like the Lord was confirming that this fear/confusion is part of the spiritual darkness of the campus – it was a powerful time of affirmation for me and of understanding of the spiritual climate on campus. As we began prayer-walking, I saw a woman sitting at the soccer fields where I normally go to pray (Lydia in Acts 16 came to mind instantly). I went up and asked her if I could pray for her and she told me that she was a Christian professor in the Psych department on campus – amazing! We had a really rich time of prayer together and she was super encouraging about the need for IV on campus and even confirmed for me that the fear/confusion I was feeling was definitely a reality on campus. We walked a little further and came upon a campus security officer. Will approached him and struck up a similar conversation. Turns out he is also a Christian and an artist who uses painting to share the Gospel with people. He prayed for us and let us pray over him as well – again, just a powerful feeling of welcome from the campus. As I was walking through the student center and about to grab some lunch, I randomly heard two students talking and one of them used the word “ministry.” I decided to just insert myself into their conversation so I stopped and asked what they were talking about. Turns out one of them is a music minister at his local church and both are believers. We talked for a little bit before they had to get to class but I have a good feeling about their potential as partners in mission as our relationship develops and I continue to see them each week on campus. Those few hours on campus were a powerful affirmation of God’s call for me and such a great way to start the year with the new plant. In InterVarsity lingo, NSO stands for “New Student Outreach,” the first few weeks of the school year in which InterVarsity staff and student leaders meet incoming freshmen and other new friends and invite them to become part of our communities on campuses all over the country. These posts are a few snapshots of the beginning of the school year on a few of the campuses where I either staff or oversee other IV staff. This story happened on Wednesday. The first week of school keeps rolling forward! On Wednesday, UMSL (the University of Missouri-St. Louis) had their student organization fair, which they call the Fall Expo. If you’re unfamiliar with the campus ministry world, these fairs happen on most major university campuses and they are one of the primary ways that organizations like InterVarsity meet new students on campus. At places like UMSL, dozens of student groups will set up booths and give out information about their organization as students walk past. I actually found out about the Fall Expo too late to reserve a space. However, as God continues to teach me, planting/re-planting is much more about partnership and learning from cultural experts than it is about my imported expertise. My friend Andi has been running a fantastic InterVarsity ministry aimed at reaching internationals on campus at UMSL for the past few years and she is also very gifted at organization. Andi was the one who told me about the Expo and, in the same breath, also mentioned that she would love to share her booth with me. She was willing to use half the space they would normally have to connect with students to help me have a place of legitimacy on campus – what a gift! I called a former UMSL student named Robrion and we showed up with our fliers, fruit snacks left over from Sunday, and all the extroverted energy we could muster. In the course of a couple hours, we managed to connect with over 50 new students and more than 20 of them signed our contact cards to tell us they were interested in hearing more about our upcoming activities. A few of the students seemed like they were particularly interested in having a place on campus where they could be trained to see themselves as missionaries – this is exactly what I’m looking for at UMSL and at Flo Valley. We even got to connect with two Christian faculty members which is a huge gift for me as we come to a new campus. Christian professors/administrators can make a big difference in lending credibility to a group like ours. One of the biggest lessons I’ve been learning this week has been the incalculable value of partnership as we take risks for the Kingdom. I feel like I have done something everyday this week that scares me and that I would have had every opportunity to run away from had I not had someone with me in the trenches. There is something about community that makes us braver and more willing to sacrifice and step into the fray than we would ever be on our own. I am a true introvert but, if you pair me with someone who is counting on me to say yes to Jesus, I will talk to anyone, anywhere. Send me on my own and I may suddenly have loads of work to get done on my laptop in a quiet corner somewhere. But when I remember to call a friend or invite a student or co-worker to come with me, I see Jesus do amazing things on campus. Praise God. IV Staff, Domenic (second from right), leads students through the Story Proxe. In InterVarsity lingo, NSO stands for “New Student Outreach,” the first few weeks of the school year in which InterVarsity staff and student leaders meet incoming freshmen and other new friends and invite them to become part of our communities on campuses all over the country. These posts are a few snapshots of the beginning of the school year on a few of the campuses where I either staff or oversee other IV staff. This story happened on Tuesday. Today, I had planned to do some scouting and prayer-walking at Flo Valley but, last night, I received a text from one of my staff needing help running a large-scale outreach event on campus today. I shifted my schedule around and made my way to Webster this morning to lend a hand with a proxe station. Proxe Stations are one of my favorite things we do in InterVarsity. 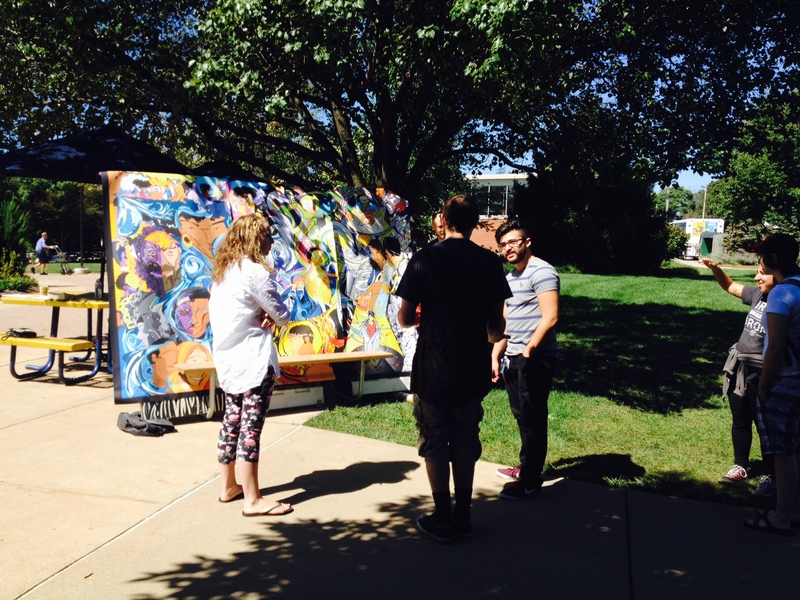 They are interactive and eye-catching displays that we set up on campus and use to engage students in spiritual conversations. There’s normally some sort of prompt or survey that has a way of leading into a deeper conversation where, even if for just a few minutes, we get the chance to share stories and really connect with students as they make their way to class or lunch. Our chapter at Webster was adopted by InterVarsity a year ago but began as a ministry planted by our IV Staff, Domenic, when he was a freshman on campus there. He came to campus as a brand new Christian with a powerful vision out of Jeremiah 3 that God would “bring his wandering children home” at Webster and began a new ministry that eventually had 25-30 people showing up every week. I met him his senior year when a former boss of mine who had taken a job at Webster emailed me to tell me that she had met a student who wanted to do college ministry but had no idea how to do it as a career. She thought I might be able to help out with that. I was more than happy to oblige. Flash forward 18 months later and Domenic is a chapter planter with InterVarsity, leading a core of mission-minded students to take innovative risks, like running this Proxe Station, to reach their campus with the Gospel. Pray for our chapter at Webster – that Jesus would draw wayward children to himself this year and that many leaders would be developed to take that message to every corner of campus. In InterVarsity lingo, NSO stands for “New Student Outreach,” the first few weeks of the school year in which InterVarsity staff and student leaders meet incoming freshmen and other new friends and invite them to become part of our communities on campuses all over the country. These posts are a few snapshots of the beginning of the school year on a few of the campuses where I either staff or oversee other IV staff. This story happened on Monday, the first day of school. On Sunday, I went to a campus ministry fair at UMSL for the first time and got to talk to several students, all of whom I invited to meet me for pizza the next day to celebrate the first day of school. As I’m still learning the UMSL class schedule, I planned the lunch to start in the middle of the last class before the lunch break (awesome). So, while I was sitting there, by myself, with four boxes of pizza, a random guy asked me if he could sit down and eat his lunch at the table. We ended up having an awesome spiritual conversation that he just sort of kept pushing his way through. By the end, he pretty much asked himself to study the Bible with me and we’re going to be studying John together on Mondays for the next little bit. Bonus Points: After about 30 minutes of this, the other students I had met (mostly Christian) also started showing up and got to interact with him and watch me invite him into the GIG. When he left, I got to debrief that with a freshman who had stuck around until the end. Not exactly what I was looking for when I bought the pizzas but, hey, I’ll take it! One of my (sometimes begrudgingly) favorite parts of ministry is when God shows up and destroys all the expectations and plans I had for the day and opens the door for something much better than I had imagined. I love it when students are along for the ride when this happens as well. I can’t imagine a better place to learn than in the throes of an unexpected interruption where we have to trust God to work. These students will (hopefully) know from Day 1 that it’s not my skill in planning that makes ministry happen; it’s Jesus showing up and our deciding to walk through the doors that he opens. In InterVarsity lingo, NSO stands for “New Student Outreach,” the first few weeks of the school year in which InterVarsity staff and student leaders meet incoming freshmen and other new friends and invite them to become part of our communities on campuses all over the country. These posts are a few snapshots of the beginning of the school year on a few of the campuses where I either staff or oversee other IV staff. I am calling this Day #0 as it happened Sunday, before the first day of school. This is an exciting new year for me as an InterVarsity staff. For the past seven years, I have staffed the InterVarsity chapter at Saint Louis University. In fact, this is the first August in 10 years that I have not been on SLU’s campus for the first day of school, including my time as a student! This year, I am embarking on the new (and sometimes scary) adventure of planting a new ministry at a local community college (Flo Valley), restarting a ministry at a local commuter school (University of Missouri-St. Louis or UMSL), and supervising four InterVarsity staff at four other area schools. It’s a big job with a lot of spinning plates but so far, I’m really enjoying it. I began my NSO season this past Sunday at UMSL with a fun little event called “Find Your Faith” in which students are encouraged to come to the campus chapel to meet different faith organizations that exist on campus. I started off the morning at a Family Dollar, wandering the aisles in search of a fun and easy snack to giveaway at my table (college kids + free food = open doors for conversation). I ended my search with about 10 boxes of fruit snacks and a strange look from the cashier, and made my way to campus. I arrived and found a parking spot where, mercifully, a few other ministers had also arrived and were walking in (I had no idea where the building was). We set up our tables and they were even gracious enough to let me have the best spot as the new guy. In about 30 minutes, I met about 25 students and a little over half of them signed a contact card indicating that they were interested in learning more about InterVarsity. I invited all of them to join me for pizza in the student center the next day (more to come on that). I also got to connect a bit with some of the other campus ministers who have been there longer than me and I look forward to learning from and partnering with them. All in all, I felt pretty grateful for my first morning at UMSL and I’m excited to see what doors Jesus will open on this campus!